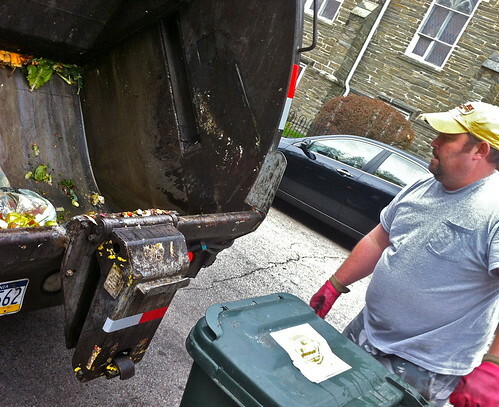 It’s a company called Philly Compost. What they do is organic trash. So anything you can put in your mouth or anything that can compost, they take, they’ll put into a field, mix it with dirt and leaves and then resell it as compost. WHAT ARE YOU PICKING UP TODAY IN CHESTNUT HILL HERE? Today, Tavern on the Hill is a local restaurant. I’ll get two cans off of them, all their restaurant waste, lettuce heads, anything gone sour or leftover from a plate after a customer ate it … So this is the back of Tavern on the Hill. This is our logo, ‘In Soil We Trust’ WHAT DO THEY GOT IN THERE? Hopefully green bags. These green bags are compostable. There’s napkins, banana peels are great, carrots, paper. IT LOOKS LIKE THERE’S SOME CHICKEN BONES TOO. CAN YOU COMPOST THAT? Anything organic, anything that will break down is fine. We can’t take plastic, metal, Styrofoam. WHO’S PAYING WHO TO TAKE THIS AWAY? There’s two advantages. One if I’m a restaurant and I say to my patrons “Hey, I’m reducing trash that’s going into a landfill by separating it out and composting it, that’s a benefit to the environment. The second thing is, now I’m reducing what I pay in my dumpster so my trash costs go down. DO THEY PAY YOU A FEE TO TAKE IT? They pay us, they do a monthly thing and then per can. AND IT’S LESS THAN PUTTING IN A DUMPSTER? Ideally, yes. And we pay to dump it and that guy’s making money when it’s dumped and when he sells the compost. 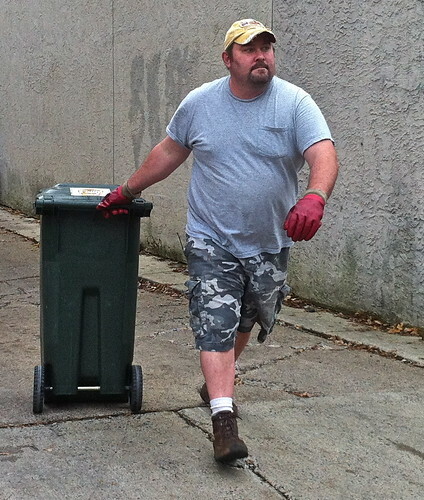 Jason Hopler, Philly Compost. My book is called a deconstruction book and it’s like when you get a plain old book that nobody reads, sits on the shelves at stores and stuff and getting it and exposing the information in a 3-dimensional work of art. WHAT’S THE BOOK ABOUT? It’s about astronomy, all about the planets, the moons, suns, stars… I can name you everything inside. Right here there’s an asteroid and it’s called Hyperion and Hyperion back in Greek mythology was one of the Titans of the East. 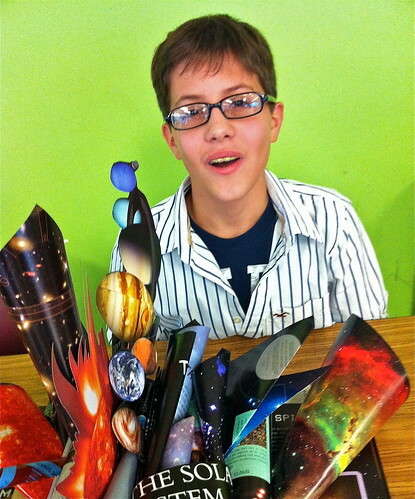 Javier Peraza, of South Philly, with his project for an application interview at the Science Leadership Academy. PRETTY EXCITING YOU’RE OPENING UP HERE IN CHESTNUT HILL. Absolutely. Very excited about it. It’s really a great area, really excited to be opening soon. I HAVE A COUPLE OF QUESTIONS. ONE IS FOOD ALLERGIES BECAUSE I HAVE ONE. SO ON YOUR MENU WHAT KIND OF ACCOMMODATIONS DO YOU MAKE? Everything is pretty much from scratch so the chefs have the ability to do that. Our servers are well educated what ingredients are in the menu. Ask and we can make most accommodations. HOW ABOUT AVOIDING GLUTEN? We have a gluten-free menu as well. BEAUTIFUL. ANOTHER THING I’M CURIOUS ABOUT IS YOU GOT A PRETTY CLASSY LOCATION. I’M HOPING THE PRICES AREN’T TOO CLASSY. The prices are the same at all our other 8 restaurants- mid-price. AND WHAT’S YOUR TARGETED OPENING DATE? We hope to be open the first week of January. LOOKS LIKE YOU HAVE A LOT OF WORK TO DO. A lot of work to do, miles to go before we sleep. 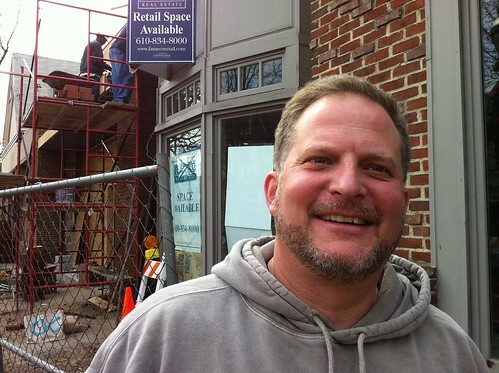 Mark Edelson, Iron Hill Brewery. Watch video interview here.